Throughout the next few days, we will be posting some gift giving ( or gift hinting ) suggestions of some of the fun stuff we have in the shop. Today we are featuring items from our Dapper Commuter gift guide. For the person who has a great sense of style and likes to travel in the same fashion. Always on the move but doesn’t sacrifice looking good for comfort, they know they can have both. Lightweight and slim backpack by Bellroy. Warm boot socks by Stance. 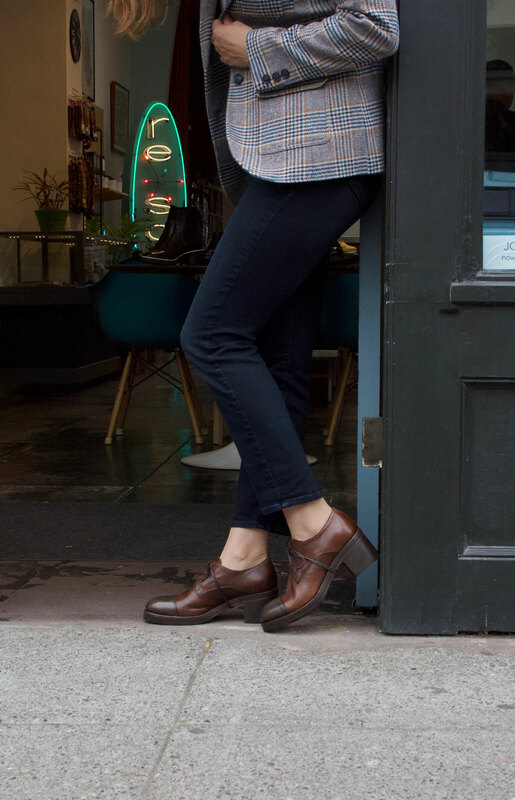 Italian brown oxfords by JP David. Passport holder and Note Sleeve wallet by Bellroy. Cloth shoe bag by re-souL. With Father’s Day around the corner, we thought we would suggest some ideas that dad will be sure to appreciate. Okay, technically it’s more than 5 gifts, but we’re not counting. We have too many apropos things not to include on this list. Besides, dad never buys anything for himself so you should do it for him. Because what father really needs another coffee mug or silly tie anyway? Do dads still wear ties? Happy Thursday! The sun has made a quick appearance today, but these long, gray, gloomy days have us yearning for color! A small way to add some chroma to your life is through your personal accessories. Il Bussetto has some cheery hues for your card carrying and it can make all the difference. Have you ever tried looking for a black wallet in a dark handbag? A pop of color can bring a smile to your face and make it less frustrating! But, hey, if you like black we have those options too. To see more of our Il Bussetto collection go to our website resoul.com. For mood board inspiration follow us on Pinterest. Sometimes you come across a brand that you fall in love with instantly. I remember the first time I saw an Il Bussetto wallet. A customer was at the counter and pulled it out of her handbag. I was immediately smitten and of course had to ask who made her wallet. It took me a couple of months to track it down, but we did and I was so happy to finally find a wallet collection that aligned with the quality of the assortment of shoes we have in the shop. After all, good leather is good leather and we love nothing more than good leather! This time of year everyone is very busy running around trying to keep up and get things done. So we thought we would put together a few suggestions and created a few gift guides that we will be posting here on the blog each week for the month of December. Well, just in case you are looking for something thoughtful and unique, we at re-souL have some great ideas; paper goods, socks, wallets, shoe care products are just to name a few. See you soon! Still stumped? Here’s some more gift ideas for you. Here at re-souL we have always had an eye out for quality, distinctive and conscious products. It’s part of why we exist in the first place and one of our key driving principles when choosing what we sell in our store. So of course we were absolutely thrilled when we started carrying Australian brand Bellroy in our little Seattle shop. Started in 2010 by surfers Andrew and Hadrien who lived between Bells Beach and Fitzroy, (hence, the name Bellroy) Bellroy is a combination of the two worlds. Wallets designed to function between work and play, taking inspiration from the lifestyles of an urban town like Fitzroy and the coastal surf town of Bells. Bellroy’s main goal is to help you slim your wallet through inventive and just downright cool ways of storing your cards, receipts and cash. But just slim isn’t enough. They strive for their products to look elegant, be functional and fun to use. They have 5 insights that guide them in the design process. Here is what they have said about these key things as quoted in Opumo. 1/ Work & Play are merging – more than ever, our social and business lives intersect. We need to have toys that can make these transitions with us. 2/ Guys carry more stuff – men and women carry more technology and items more than ever before. We need new ways to protect and access these, without compromising on size or style. 3/ We want deeper brand relationships – no longer do we want to just be sold to. These days we want brands that have strong values, brands that engage with us openly and honestly, with social and environmental considerations a must. This stuff is not easy to live up to, but it’s worth trying for. 4/ This is not for a sedentary lifestyle – it’s nice to be able to ride to work, run for the bus, or take off on an impromptu surf trip. Our products are made to adapt to anything you throw at them (well, maybe not the kitchen sink – but can you even throw a kitchen sink?). 5/ Modern Craft is not an oxymoron – we want to combine modern progress and insights with the joy of the craft world. Beautiful pieces that tie these two places together. With a narrow focus, constant learning, agile processes and creative thinking, they continually improve the solutions to the perfect carrying wallet and having your pocket contents adapt along with you. Making them the ideal wallets for the individual who seeks different alternatives to the standard bi-fold. To see more styles and find the perfect match for you visit resoul.com. 4. Does dad have a desk job? How about one of these fun wooden birds from Architect Made? These 2-piece bird sculptures are simple in design but their pose-ability allows infinite creativity. Dad would have fun playing with one of these. $52 – $70.